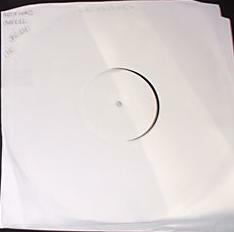 In 2008 in December, just a few weeks after a copy of AOS Back To Black test pressing was sold on Ebay, a test pressing of the Overkill 3 LP set was listed on Ebay by humanjigsaw1984 in Wallingford, Oxfordshire, United Kingdom. It was the same seller, humanjigsaw1984. He claimed he worked fo the company who pressesd the vinyl and listed it as "ONLY 5 SETS IN THE WORLD" and "COMES WITH CUTTING SHEET", just like the AOS. And he also listed a test pressing of Iron Fist. The records were on black vinyl and housed in standard white die cut inner sleeves that were taped together with transparent tape. In January 2009 he listed another copy, now without cutting sheet. On this copy Disc 1 had "Motorhead Overkill BOBV 112 LP / AB / H" handwritten on top of the sleeve, disc 2 had "BOBV 112 LP / CD / H" with a different handwriting and disc 3 had a white sticker on top with "BOBV 112 LP / EF / H" as black print. The labels were white with "side A" printed in black on side 1 and completely white labels on side 2 except for disc 2 that had a handwritten "B" on side 2. GBP 92 December 2008 (armedandready), GBP 87, January 2009 (mjohansson), Ebay.